Roby Park has maintained Healthy School Status and awarded Bronze Status in recognition that we encourage children to lead a healthy lifestyle. We are delighted to be part of the Fruit for School Scheme for the Early Years and Key Stage 1. We have fresh fruit delivered to the school throughout the week which the children eat at playtime. Children may bring in fresh fruit, vegetables or a healthy snack to keep them going through the morning. NO NUTS, as we have children with severe nut allergies. We also provide children under 5yrs with a milk drink each day. KS2 children are offered toast each day at the cost of 60p per week, payable on a Monday. Our school meals are provided by Knowsley LA and are cooked daily by our school cook. 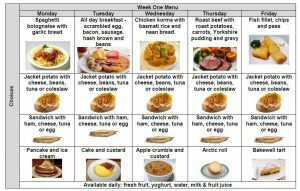 School dinner menus are changed weekly, on a three weekly cycle. A copy of the school menu is displayed on the notice boards and in the school hall. The children are encouraged to select a balanced meal from the menu. If you would like your child to have school lunches, we ask you to commit to half a term at a time. 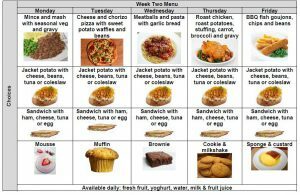 You must pay for lunches in advance by the week, half term or term. Lunches can be paid for at the office, with the correct money in a named envelope. If payment is missed for one week, a reminder message will be sent, followed by a call. If payment is missed for two consecutive weeks, we will ask you to provide your child with a packed lunch. Please speak to the school office. Your application will be treated confidentially. We have a healthy lunch policy and do not allow sweets, nuts, chocolate or fizzy drinks. We suggest a sandwich, yoghurt and a piece of fruit. Children should bring water to drink. Please ensure that your child’s lunchbox is clearly labelled with their name. 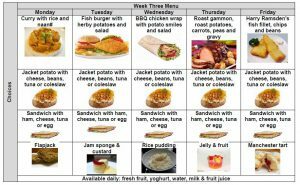 For ideas for packed lunches look at the Healthier Lunch Boxes leaflet.